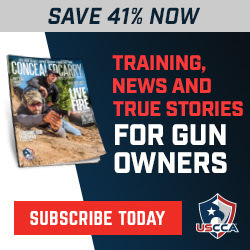 Click here for the USCCA FREE DVD set !!! We will donate $22 to #22Kill for every USCCA "bundle" purchased! We are proud to announce our class sessions featuring the United States Concealed Carry Association curriculum. These courses are designed to follow a basic LTC course and are accepted in many states as LTC qualified courses. At your first session,you'll get a copy of "Concealed Carry and Home Defense Fundamentals" by Michael Martin. A $30 value, it is 240 full color pages and covers the curriculum for all three courses. Textbook is available separately as well, choose "Textbook Only" from the menu below. Home Defense- This course covers developing a personal and home defense plan, security review checklists as well as conflict avoidance and many other topics. Session is appx 2.5 hours classroom, followed by home defense shooting drills on our range. Bring your LTC, home defense pistol,eye and ear protection and 100 rounds of ammunition. Basic Handgun- This course delves into the operation and function of your home defense pistol, and also helps take out the guess work when making a purchase. We'll talk gear and gadgets, pros and cons of differing types/actions as well as some ammo basics. The session is two and a half hours in the classroom and range time. Bring your LTC, home defense pistol,eye and ear protection and 100 rounds of ammunition. Concealed Carry- The perfect session for anyone planning to use a firearm for self and/or home defense. Covering developing a personal protection plan, firearm basics, shooting fundamentals, the legal use of force,violent encounters and their aftermath and how to train for them, as well as gear and gadgets. The session is 4.5 hours in the classroom and then some range time. We add CT and FL required info so you can apply for multi-state licensing. Bring your LTC, home defense pistol,eye and ear protection and 100 rounds of ammunition. OR TAKE ALL THREE IN A BUNDLE !!! UPCOMING CLASS SCHEDULE LOCATED ON THE UPCOMING SESSIONS PAGE! Women's Handgun and Self Defense Fundamentals by Beth Alcazar. Explore Basic Pistol, Intermediate and Defensive Pistol sessions all with an emphasis on female specific information. Basic safety,live fire drills,clearing malfunctions and gear choices are all part of the fun. Bring your handgun,holster and eye and ear protection and 50-100 rounds-or let us know you'd like to borrow! Take them separately for $49 each or all three sessions for $139 ! "Other organizations teach you how to shoot a gun, the USCCA also teaches how to OWN one "